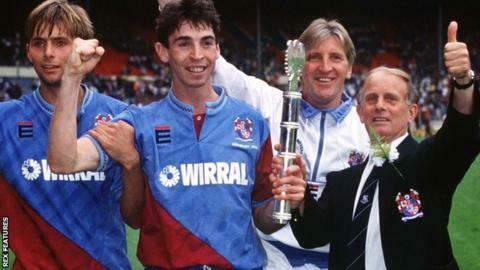 Former Tranmere Rovers boss John King has died aged 77. King, a midfielder for Everton in his playing days, had two spells in charge of the Prenton Park club between 1975-80 and 1987-96. He took the club from the Fourth Division to the brink of promotion to the Premier League in 1994, when they lost in the play-off semi-finals. "Johnny will forever have a huge place in Rovers' history," Tranmere chairman Mark Palios said. "He will be greatly missed by all those who worked with him, played for him and knew him at Tranmere Rovers." King started his career at Everton in 1957, making 48 appearances for the Toffees before going on to play for Bournemouth, Tranmere, Port Vale and Wigan Athletic. "RIP Johnny King - a talented player for Everton and Tranmere who became a great manager at Prenton Park," Everton tweeted. In addition to his two spells in charge of Tranmere he also managed non-league sides Northwich Victoria and Caernarfon Town. He guided Welsh side Caernarfon to the FA Cup third round in the 1986-87 season.